We consider a call ahead as if you were physically in the restaurant. We will add your name to the wait list and tell you the current wait time. We suggest that you arrive 10 minutes early, just in case the wait is moving quicker. If we happen get to your name before you arrive, we will move your name to the bottom of the list. If we are not on a wait, then we will inform you to come on down to the restaurant. Please be advised that there might still be a small wait when you show up, depending on how many guests have arrived during your travel time. Larger groups will experience shorter waits if they do not mind sitting at multiple tables. 75% of your group must be present in order to be seated. 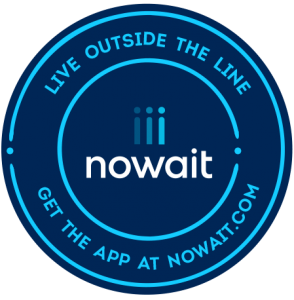 Click to download the NoWait app and get in line right from your phone! We’ll even tell you what the wait time is and your place in line. What's the point of a call ahead? The purpose of Call Ahead Seating is to minimize your waiting time at the restaurant, when we are on a wait. What's the difference between a call ahead and a reservation? A reservation is a guaranteed time that you will be sat, a call ahead will minimize your wait time. Will my table be ready as soon as I get to the restaurant? Since it is not a reservation we cannot guarantee your table will be ready as soon as you get here, there still might be a small wait upon your arrival. When should I call ahead? You are to call 20-30 minutes before you plan on arriving. What if during my travel time to the restaurant, a wait develops. There is a possibility that might happen. Since it is not a reservation, there still might be a short wait when you arrive. When should my party show up? We suggest showing up 10 minutes before your quoted wait time, in order to ensure your timely seating. What if I call 30 minutes before arriving & there is a 45 minute wait? At the time of your call we will inform you of our current wait time, that way you can relax at home or continue shopping instead of waiting in our lobby.